These are NOT mine but I want a pair. I found them here. 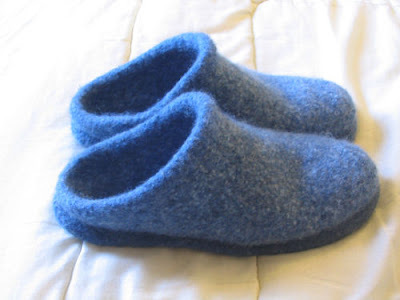 I know I am supposed to be working only on Daughter's sweater AND that I still have several WIP's put aside to make room for gift knitting BUT I just HAD to start a pair of felted clogs for myself. Had to. That is why I bought the WOTA that I posted about a few days ago. 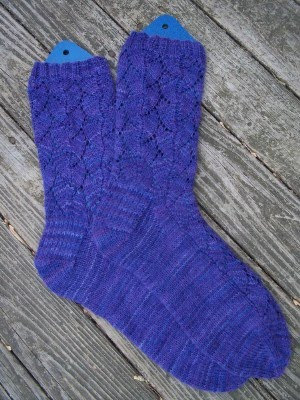 That is for the second pair I am going to make myself. The first will be in this Paton's Classic Wool in Mercury (gray) and Black. I know I am being overly optomistic already buying MORE yarn for something I haven't even finished but I couldn't help myself. The yarn devil made me do it. 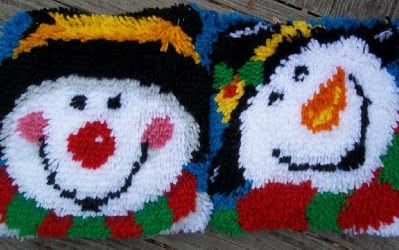 *I was so sorry to hear today of the passing of Bev Galeskas the owner and principal designer at Fiber Trends who designed this very popular pattern. The fiber world has lost an important contributor. The first sleeves on Daughter's sweater were both frogged. 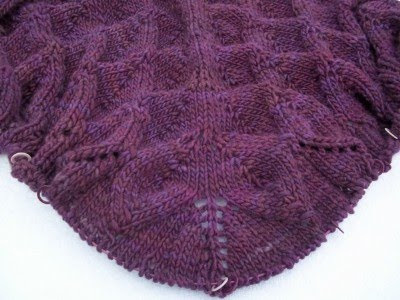 I then added a 5 row facing to the neckline for a neater edge. I also added a little more color work to the top of the sleeve to balance the top panel but I don't like it. Goodness. I pretty much redid the entire thing AGAIN and I'm still not happy. I am afraid I am heading back to the frog pond. Designing as I go is slow going indeed. I got a box of sunshine today in spite of the miserable weather. Meet my new BFFs Prism and North Woods. 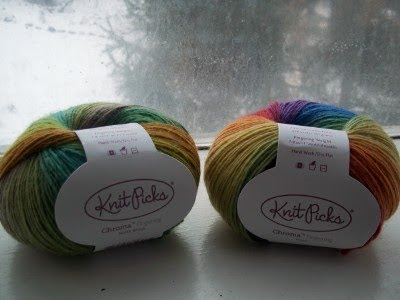 Chroma from Knit Picks is BEAUTIFUL. Just what I need to cure a bad case of post holiday blues. I also threw in a few skeins of WOTA into the order for a new project that I am not supposed to be working on until I finish the millions of WIPs I have hidden away. More on that later. I am not ready to own up to it in public just yet. The gift knitting, as usual, caused me to ingest large amounts of Tums. Every year I swear I will not get caught up in the obligation of it and every year I ignore my brain and load myself down with unrealistic goals. Stress induced mania aside, #2 son's Bearded Hat actually turned out better than I expected but everything else landed somewhere between fail and meh. BTW, That's me in the hat and beard. Son #2 spent his holidays with his dad so this is his first look at his gift. Crazy, huh? It was your brother's idea. 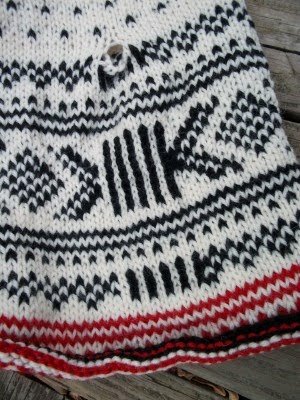 The Norwegian sweater didn't get finished because it is going to have it's sleeves frogged. I hate the join. 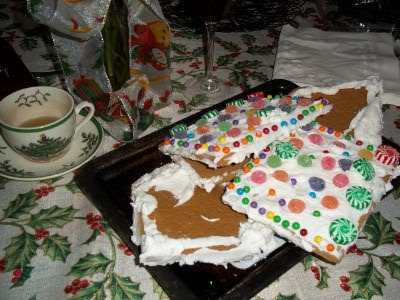 It is too bulky and the seams hit in an awkward place. 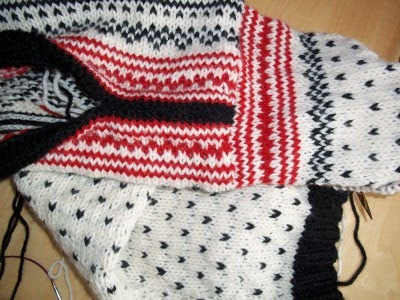 The Norwegians had it right-silly me to try to change the pattern. The future MIL socks Daughter asked for turned out HUGE. MIL wears a size 9 shoe which charted out to a 10 inch foot but these are sized for Sasquatch. I have no idea what to do with them. They are man sized but what man would wear them? frogging is the only answer but I just don't have the heart to do it at the moment. I would rather buy new yarn and start over. 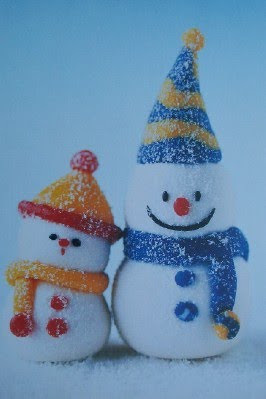 Now that I have a couple of gift IOUs to make good on, let's hope for a snowy January with plenty of couch time. 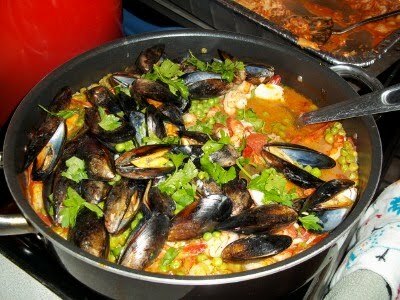 Paella and lasagna are our traditional main dishes for Christmas Eve dinner. Christmas morning, Daughter and I put together the gingerbread house. 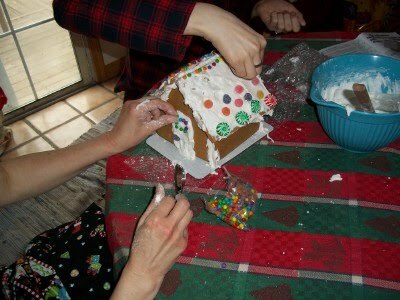 The construction techniques were sub standard this year. 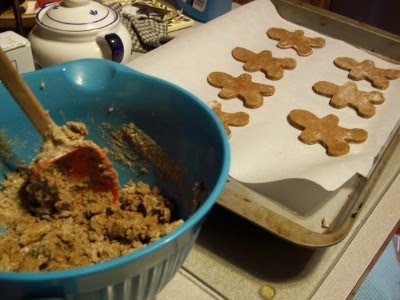 I added too much water to the icing mix. It didn't take long before it all went bad. Very bad. 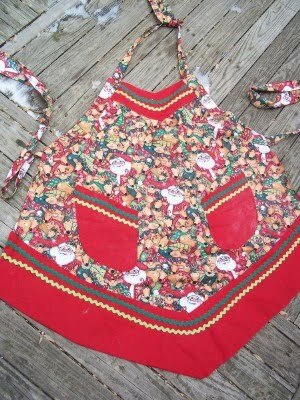 I made and used a lot of Christmas aprons this year. Unintentionally. This one was supposed to go to Daughter but turned out so yucky it stayed here with me. I found this material at Connecting Threads. 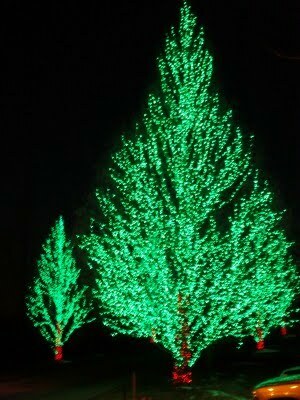 I will go there FIRST next year if I need material to coordinate. They do the work for you. This apron was gifted to Daughter. 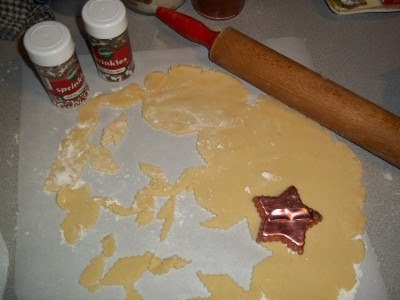 Mine is covered with flour. 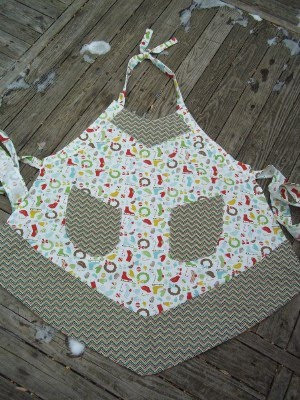 We made plenty of good things to eat, this apron and me. Now to give it a wash and pack them up until next year. Golly. 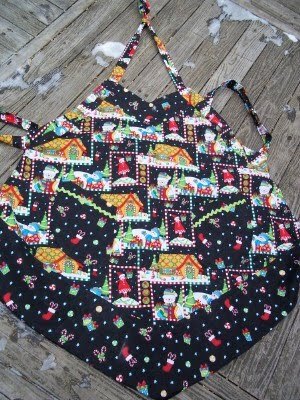 Now I need a winter apron that is not Christmas themed. It's hard to believe it is all over. 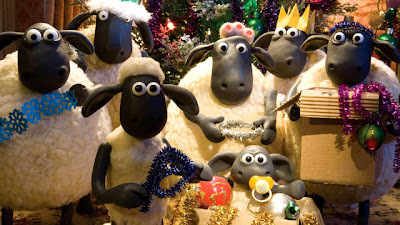 Another Christmas has come and gone. I hope your holiday has been as wonderful as mine. 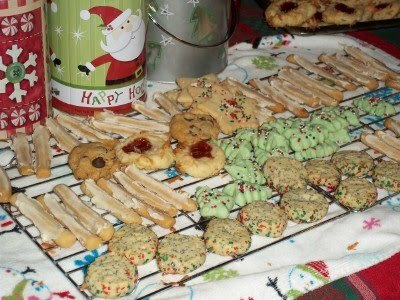 Every year since we lost Mom, Dad and I have teamed up and made a can of cookies for the family. 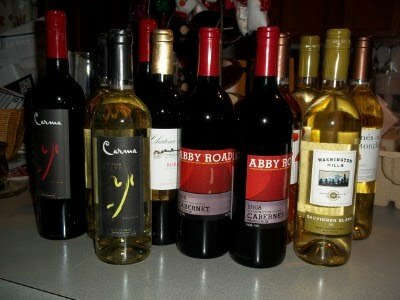 We always get together for a lasagna dinner on Christmas Eve. 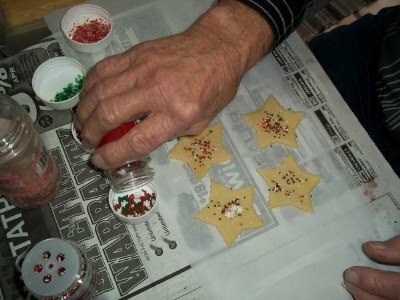 It takes an expert to get the sprinkles just right. 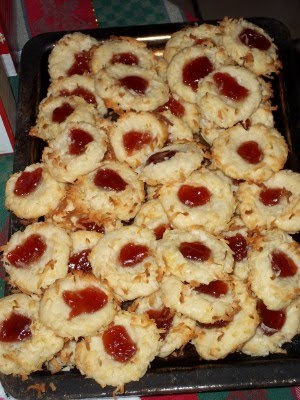 His specialty is the coconut jam thumbprints. Not bad for a morning of wrecking the kitchen. Daughter is getting the best Mother in Law in the world. 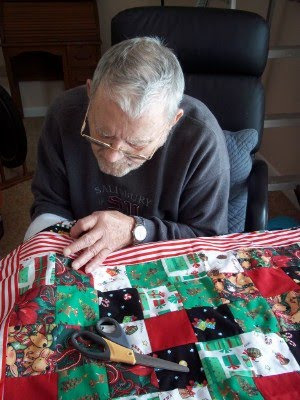 She is a master quilter whose skills I envy greatly. 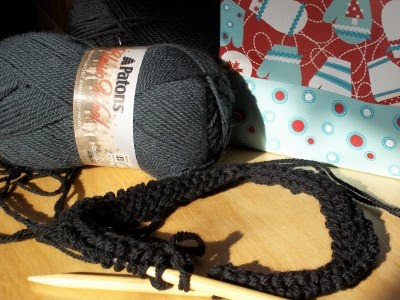 Daughter saw this 'Tis the Season Snowflake kit on Connecting Threads and asked nicely if MIL would make it for her. She was happy to do it. 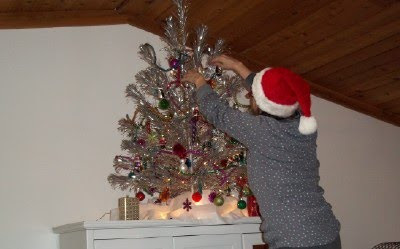 MIL just finished it and sent Daughter this picture by email this morning. Isn't it gorgeous!! I can't wait to see it in person. I feel a New Year's Resolution coming on. I really need to learn how to do this. 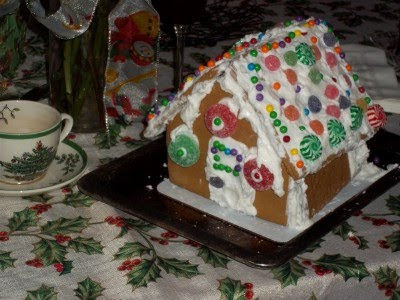 ...Santa needs to bring me a new camera. 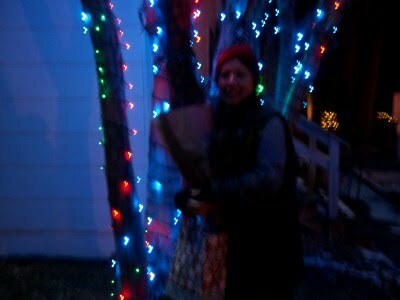 Our annual trip to Homestead Gardens is a blur in more ways than one. 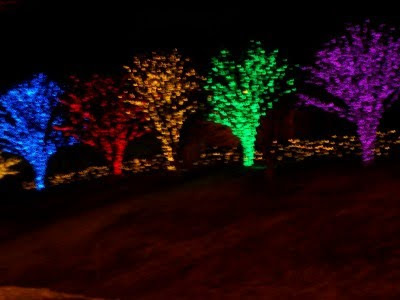 Every year I come home with a bunch of out of focus photos of all the brilliant trees inside and out. 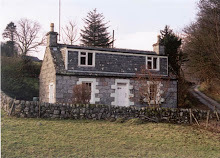 I either need a new camera or I need to take someone along who knows how to use the one I have better than I do. 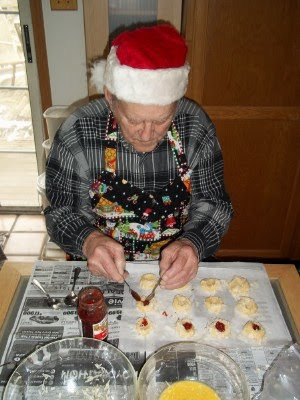 Dad and I have been working on a secret holiday project. 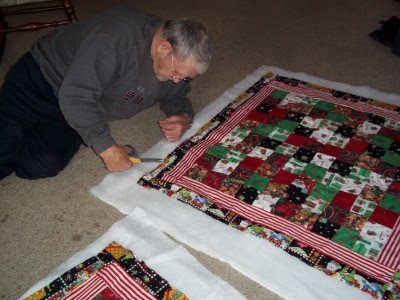 He loves to quilt so I put him to work on some top secret holiday quilting projects. 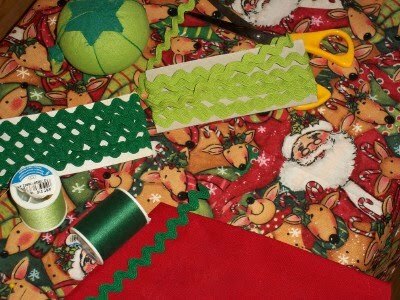 Out of the ruins of several awful Christmas aprons came two little lap quilts. Spectacular Finished Object. The Springtime Bandit it done! It is gorgeous, if I say so myself. After I stopped over-thinking the pattern it was all as easy as could be. 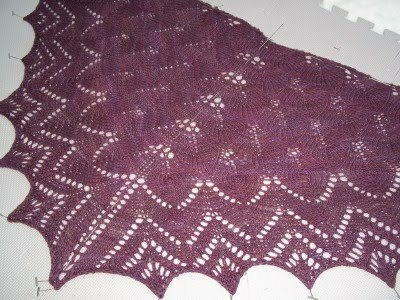 It is large enough to be a shawl but small enough to be scarf-if you wrap it with the point in the center. The yarn is thick enough to be warm and thin enough not to make you feel as if you are choking to death. As for the itch factor, hmmmm....it has a bit more than I hoped for but-I am super sensitive about things touching my neck. Most people claim Malabrigo to be one of the softest yarns out there so I am hoping that the recipient will find it acceptable. 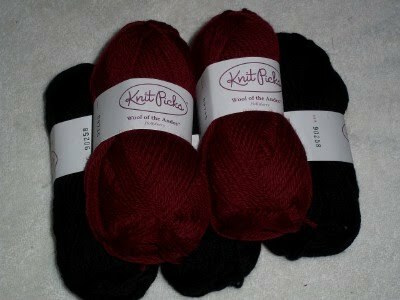 As I neared the end, in a panic last week, I ordered an extra skein but didn't need it. 2 skeins were perfect. 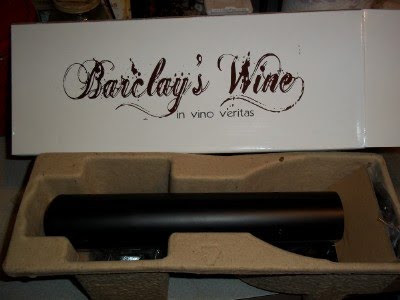 I am definitely adding this to my "make on for myself" list as soon as I save up the $$$$. Malabrigo ain't cheap. *Yes, I see that the points on the left side are not pulled out as far as the right. This photo was taken after I had wrestled the cats off of it for two nights of drying time in a row. I had to put the blocking mats together twice while the scarf was still pinned to it. I haz to miny dam catz! 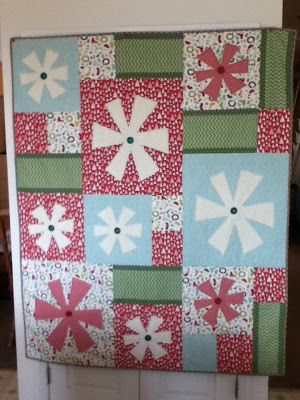 **BTW The original pattern does not call for the points to be blocked out. The scarf is supposed to have straight edge but I couldn't resist pulling them out as I saw some people do over on Ravelry. My father likes to latch hook. One Christmas I helped him make pillows for everyone. I kept two for myself and they have become my favorite holiday decorations. You just can't get any cuter than this. I have both sleeve steeks cut on Daughters Christmas sweater. I crocheted the edges and all went well with the cutting except for the fact that as suspected, I have way too much material left over. I did not need to cast on so many stitches. The folded over edge is pretty thick. I will have to get the verdict from the intended wearer when I see her next. Ewwwww.......I am 57 today. That is awful close to 60. I don't want to be 60. That sounds too much like the end of the road. Apparently somebody knows this and sent me something guaranteed to make me forget all about it. 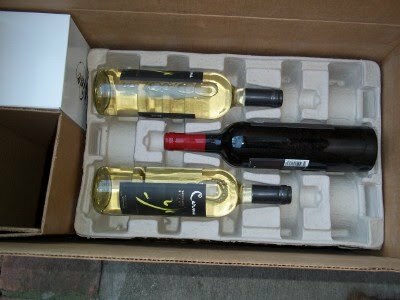 I was out gathering kindling when the UPS guy pulled up and handed me a giant box. I was pissed. I thought Amazon had sent son #2's Christmas gift to me by mistake. The whole time I gathered wood I was pissed. When I opened it I was dumbfounded. I didn't order this. At least I don't think I did. There was no card or indication of who it came from. It was addressed to me. I checked. Twice. I even got a fancy bottle opener. I feel special. Thank you mystery gifter. The black walnut dyed Cormo hat is done but it looks pretty ratty. 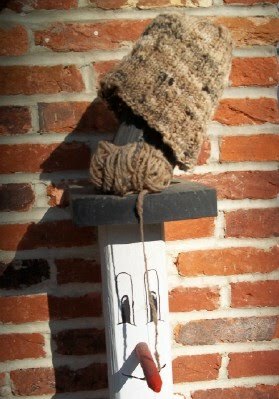 It looks better on a real head than stuck on my snowman but since I have no talent for taking pictures of myself you will have to take my word for it. 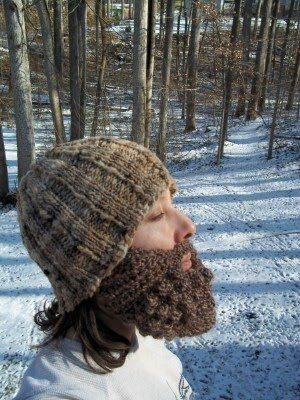 Now I have to knit a beard for it. Seriously. Don't ask. 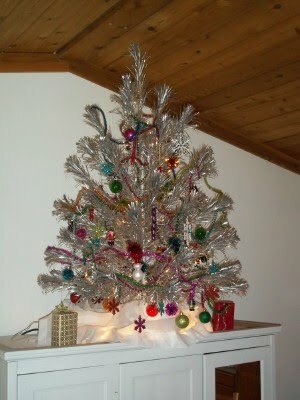 I have a beautiful vintage pom pom tinsel tree. I also have 2 kittens. 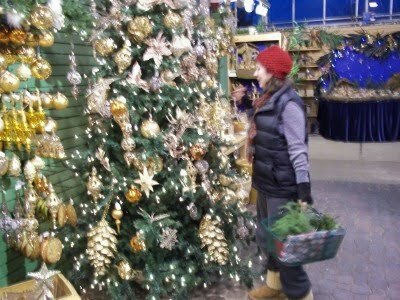 I am not taking any chances with my glass ornaments. The whole thing is going up on top of the tallest thing in the room. I need to climb a ladder to trim it but at least it will be safe from those naughty marauding kitties. Guess what I've been doing. It was a nasty rainy mess on Sunday so I spent the day inside pretending it was still December outside. 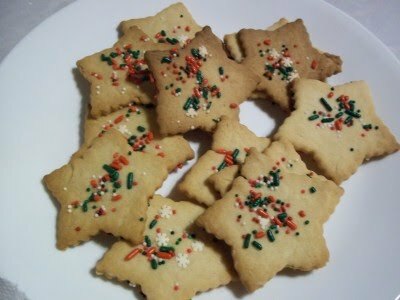 I got out all the cookie cutters and sprinkles and then burned up some sugar cookies. That's the way I like them. Brown. Very brown. 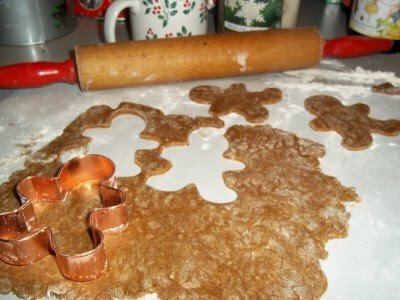 I totally wrecked the kitchen but I was rewarded with a tin of cookies to keep me company as I work my way through the pile of holiday DVDs. I've already slept through White Christmas and It's a Wonderful Life. I'm not sure what's going on but this year, the holiday movie marathon is a giant snooze fest. 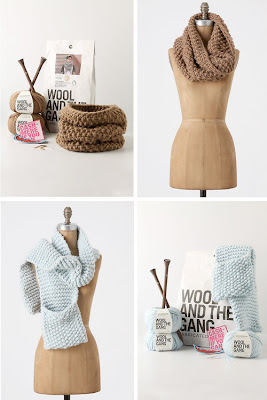 Daughter sent me a link to these knitting kits on the Anthropologie site. For $138 you can knit yourself a scarf with a pocket (ugly) and for $118 you can knit yourself a nice little snood. They call it a snood, I call it a cowl. 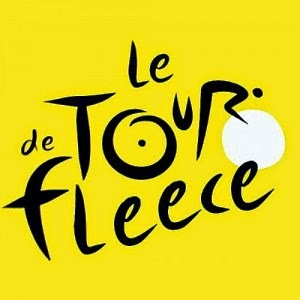 That is some pricey Merino. It is enough to scare anybody away from learning to knit. Trust me, if yarn was this expensive, I wouldn't have a house full of it. This year's Christmas card is wishful thinking on my part. Last year we had tons of holiday snow making for a perfect white Christmas. This year all we have had is the cold. And the wind. I hate the wind. I suspect it's blowing all the snow clouds somewhere else. 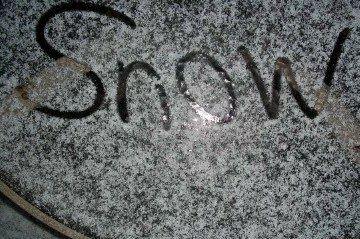 A few flakes would be much appreciated. Last year's back to back blizzards, not so much. My Christmas apron is slowly beginning to come together. My sister solved my fabric dilemma by suggesting I use a solid as the contrast. Duh. It never crossed my mind. Then she suggested rick rack. Why didn't I think of that? It's going to look very kitschy, something your Grandma would wear mixing up the highballs on Christmas Eve-if your Grandma was anything like mine, that is. For the record, I have to say that I hate making these things. Sewing machines and I do NOT get along. They seem to know just when my patience is at an end so they can jam up or run out of bobbin thread to send me right over the edge. I hate patterns even more. This is my third apron from the same pattern and you would think I would be able to sew it in my sleep but I am still looking at each and every step like I have never seen it before. Believe it or not, in spite of all my complaining, I have the material to make two more. I must be nuts. I still have to cut those arm steeks and see if it all works. I am using bits and pieces of what I have learned from other sweaters to make Daughter's Knit Picks ornament sweater knock off. It barely fits me so I think the size issue has finally been resolved. 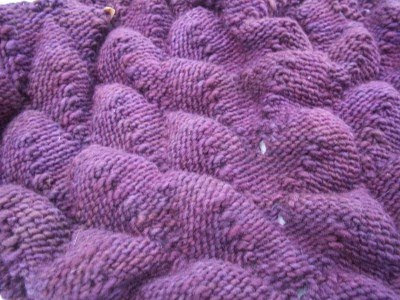 I used the Palette Cardigans sleeve steek technique but this worsted weight may prove too thick for turning under for the pick up and knitting of the sleeves. 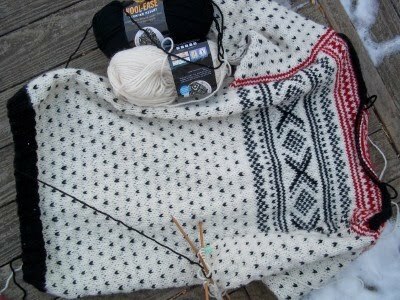 In a real Norwegian sweater the steek is tiny and you sew the arms right onto the cut edge. I am not that brave. 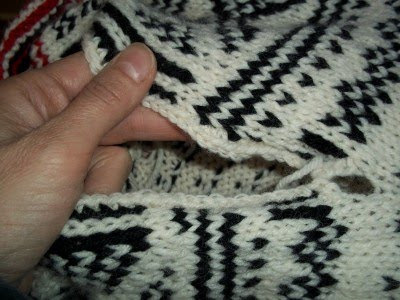 I am going to use Eunny Jang's crochet technique and then fold in the facing to give me a clean edge. I hope it is not too bulky. The sleeve seam is not on the shoulder but down a few inches on the arm so I am hoping the weight won't be an issue. Issues I don't need right now. I have a deadline. 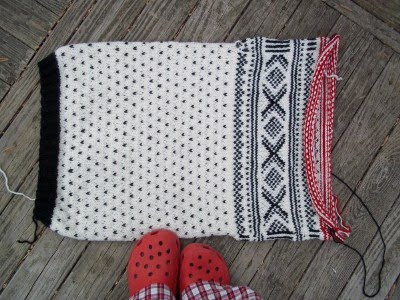 That is the back of the Spring Bandit scarf I am making as a gift. It's awesome looking. The front is not bad either. I have about 12 rows to go but I really don't want it to end. 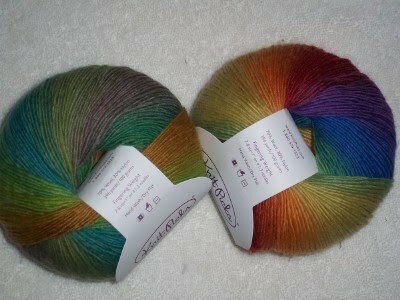 This yarn is the most wonderful stuff EVER. 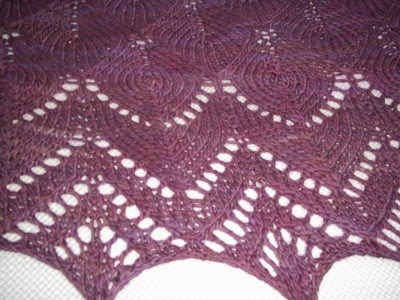 I am going to have to scrimp and save to buy some more Malabrigo worsted to make myself one of these. It is going to be hard to give it away.